LIVER STOOL – stool made of birch wood with brass badge for limited edition. The stool symbolizes the waiting time that many in need of a new organ undergoes. It is inspired by the liver shape. 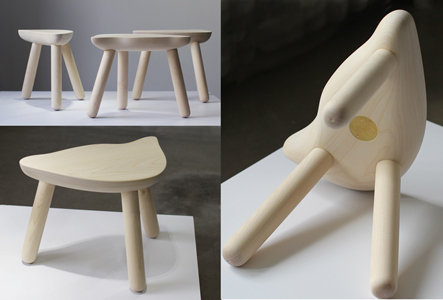 The Liver Stool is Handmade in Sweden. Dimensions approximately: height 25 centimeter, width 19,5 centimeter, length 29,3 centimeter. Price on request. The liver is the only organ in the body that can grow back to full size again after donating a little part of it. The donated piece of liver is also growing out to be a new fully functional liver in another person's body. The first successful liver transplant with living donors from an adult to a child was conducted in 1989.